The sail from Statia to St Martin/Sint Maarten was a beautiful trip in glorious sunshine, the 36 miles taking just under 5 hours with 20 knots on the beam. We were going to anchor in the Great bay at Philipsburg where the cruise ship terminal is, but reports said the waters were very rolly with ferry traffic all day, so we dropped the hook in Simpson bay near the lifting bridge which gives access to the large lagoon and marinas. Check in was easy with a dinghy dock right next to customs. The Dutch system charges per week in their waters which for us was roughly 50 US dollars, if you stay for 8 days you’re charged for 14! The anchorage is next to the Juliana airport which is certainly the busiest in the Caribbean. 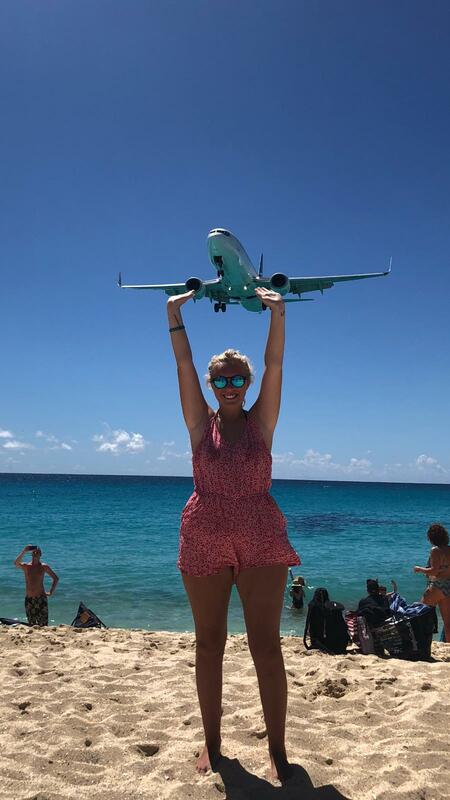 Youtube is full of videos showing the Maho beach where people stand and feel like they can touch the planes as they land. The wheels look like they only just clear the perimeter fence and the beach is right next to it. A visit to this beach was promised to Charlotte when we realised she would be with us…and just a little bit of excitement from me too! We took the RiB round and initially had trouble getting ashore as the beach was very steep with heavy swell. In the end we drove in quick and hoped not to get pooped !!! Watching the planes approaching was great fun and they really were very close, pictures don’t do it justice. When the jets leave, the full force of the engines is felt on the beach, there’s warnings everywhere about possible injury but to be honest no-one takes any notice and quite a business has been set up by local bars! This is our first attempt at adding our own video to the blog…. we’ll get better, promise! This is a very commercialised area certainly popular with superyachts and their guests/crew. We thought Antigua was popular for them but Simpson bay is in another league. The mega yacht “A” was anchored in the bay along with another “The Big Blue”. Having stayed for a week, we left the Dutch side and moved round to the north of the island which is part of France. Check in is by computer in the “island Water World chandlers which costs 2 euros regardless how long you stay….. remember now the Dutch side was 50 US dollars a week !! 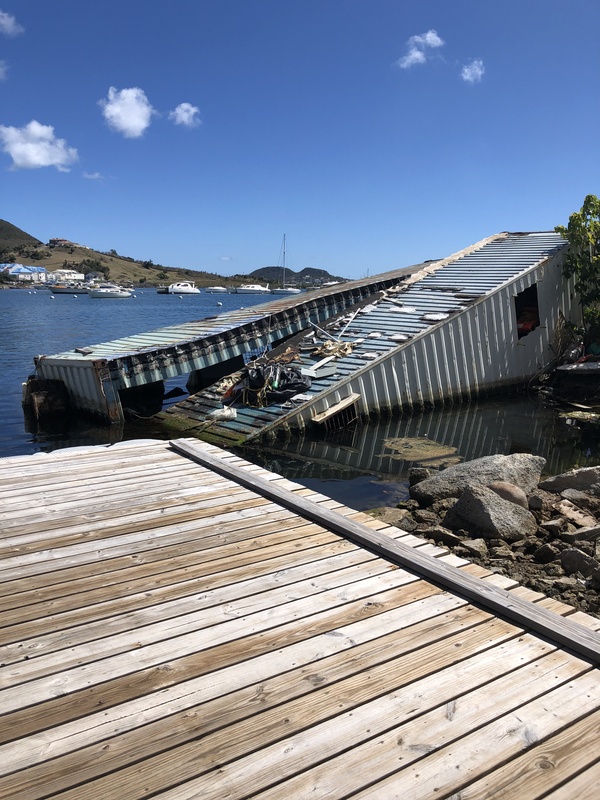 Most people know about Hurricanes Irma and Maria which struck this area in September 2017. Irma hit St Martin and Anguilla full force with sustained wind speed of 180 mph (285km/h) with gusts reportedly up to 250 mph. The lagoon which both countries share was decimated and boats still today lie sunk at anchor. Some have been damaged badly but remain afloat, some with people living on board. We’re guessing they had no insurance cover, no money to fix and just exist now unable to move, it brings a tear to the eye of the most hardened person. Buildings completely destroyed are everywhere, many with no roofs, it just looks like the remnants of a war zone. 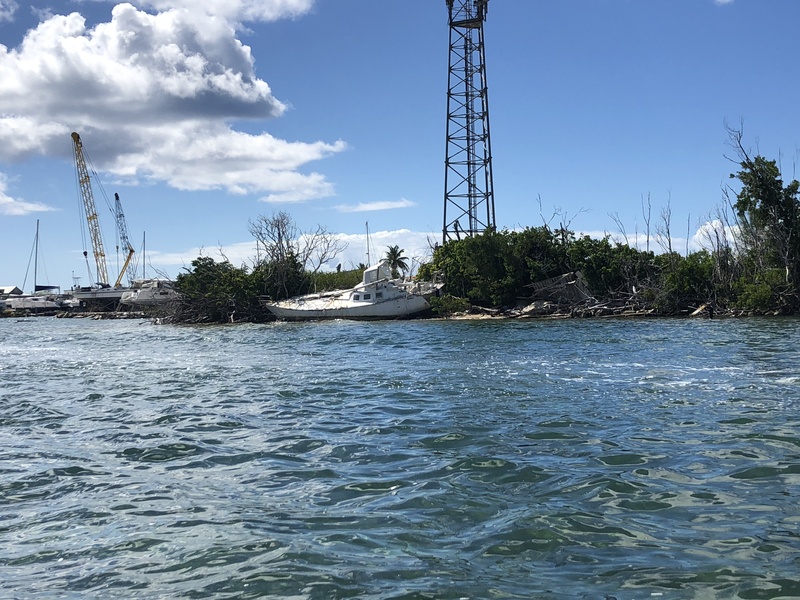 Being at anchor with 40-50 knot winds is an unpleasant experience as everything shakes and rattles… these boats and homes had no chance. 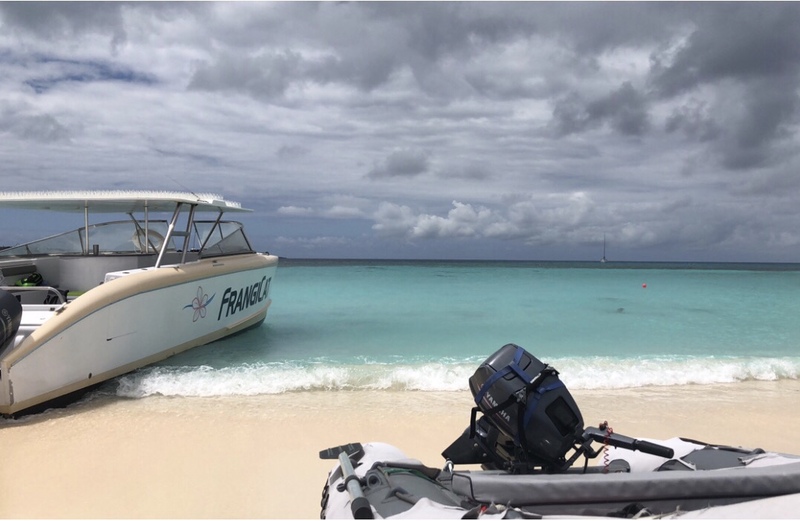 Just after Irma went through, Rebecca Bullen who is one of Nick & Carols daughters (our Atlantic crew) visited Anguilla with a film crew who were there to document the resilience of the islanders and how they were going to rebuild. 1 1/2 miles north of Road Bay the capital there is a tiny sand bar called Sandy Island. 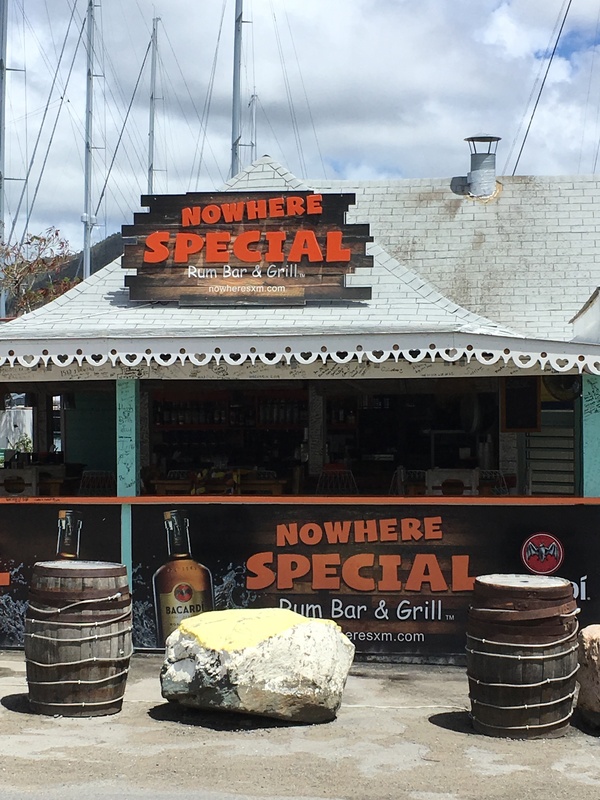 A bar/restaurant had been on the island for many years and was an idyllic location & very popular. Irma had washed it away leaving absolutely nothing behind. 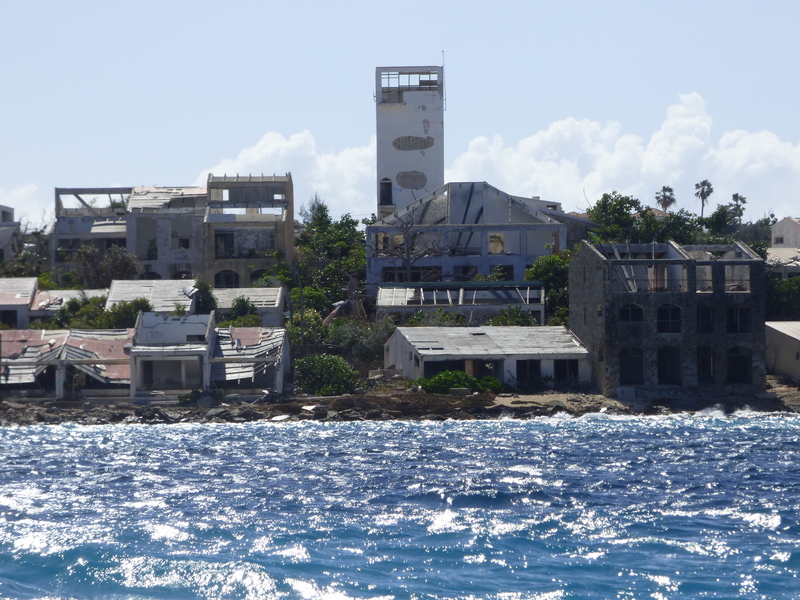 We wanted to visit and see how Anguilla and Sandy island had recovered too. Once we’d anchored in Road bay in beautifully clear water, I went ashore to find customs which was at the end of the dinghy dock. 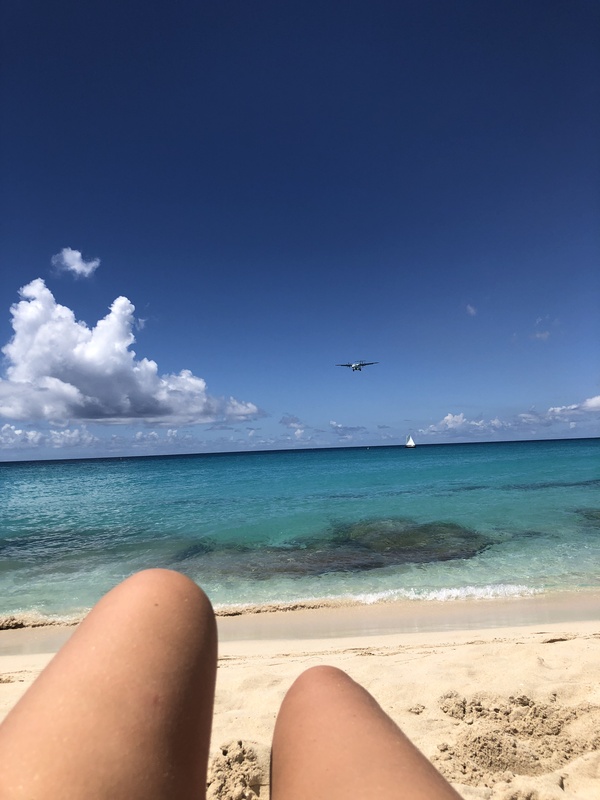 The last time I walked on such soft sand was back in our home port at Poole and the famous Sandbanks beach….. anyway back to customs, who were extremely officious and the first time since arriving in the Caribbean that I actually felt like we were a nuisance. Check in was free but if we wanted to move away from the anchorage at Road bay and anchor at other beaches we had to have a cruising permit. These permits run from midnight to midnight so if you want to anchor overnight you have to pay for 2 days at a price of 150 EC dollars a day….. that’s 84 British pounds a day times 2 for overnight. So the British overseas territory of Anguilla wanted the equivalent of 168 pounds to anchor overnight in their bays. When I said we couldn’t/wouldn’t pay that and would stay at anchor in Road Bay for free they demanded to know exactly what time of day we were leaving. Interestingly, the pricing system isn’t size related but weight related too ?? 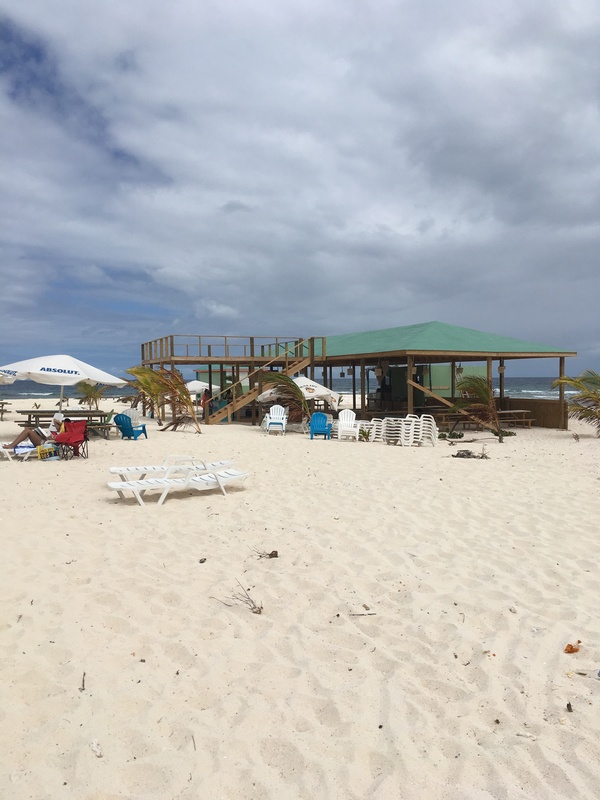 We did visit Sandy Island by using our RiB, (probably should’ve paid) & the bar/restaurant is back running along with newly planted sea grass & palm trees. A beautiful place for sure but it looks so exposed, we wish them well. In the end we left Anguilla after only 2 nights there and are now back anchored in Marigot bay St Martin having paid 2 euros ! We now start our journey south revisiting islands, we will stop at Rodney bay in St Lucia for a few days as we need to have Silhouette lifted so the rudder bearing and cutless bearing can be resealed and changed. We’ll probably antifoul too so a very busy 2 days ashore to look forward to. We have strong southeasterly winds here so can’t leave until the winds swing round to the east, which should be in 5 days time. A deep clean of Silhouette is in order !